Being a third world country, not everybody in the Philippines can have the luxury of eating pork, beef, chicken or even fish all the time, so one has to find cheaper alternatives. One of them is the canned sardines. It is a staple for most families and is considered the “poor man’s food”. Aside from being cheap, you can find it anywhere, from the groceries to the neighborhood sari-sari store. Growing up, it is guaranteed that you will find canned sardines stored somewhere. It is a go to dish when there’s nothing cooking in the kitchen. This lowly fish is also rich in omega-3 fatty acids which reduces the risk of cardiovascular diseases and Alzheimer’s disease, and lowers cholesterol. Aside from this, it is also a good source of phosphorous, protein Vit B-12 and Vit. D, which aids in the absorption of calcium in the body, so it is not a bad choice at all. Eating sardines straight out of the can is common but you can whip up several dishes with the addition of spices, vegetables and noodles to enhance its taste and flavor. It can be added to bread as a topping for a hearty snack or as a soup ingredient. Sardines with Egg is a very popular breakfast dish or even any time of the day. 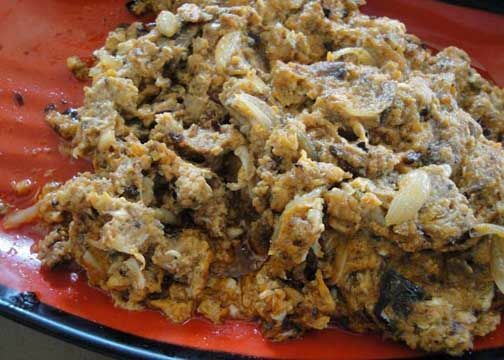 After the sardines are drained of the sauce, it is sautéed with onion and garlic, and then beaten eggs are added, along with some seasonings. So try this healthy alternative and you will see sardines in new light. This recipe is quick and easy, and anybody can do it. Grab that can opener and start whipping up this yummy dish. 1. In a bowl, mix together the beaten eggs, salt and pepper. Remember that sardines are naturally salty, so do not put a lot of salt. 2. In a frying pan, heat the oil and saute the garlic and onion. Stir until done. 3. Add the sardines and shred them lengthwise. Cook for about 2 minutes. 4. Pour in the egg mixture and continue cooking until you reach the desired doneness. 5. Transfer to a serving dish and ready to serve.